Mannose sugar, a nutritional supplement, can both slow tumour growth and enhance the effects of chemotherapy in mice with multiple types of cancer. 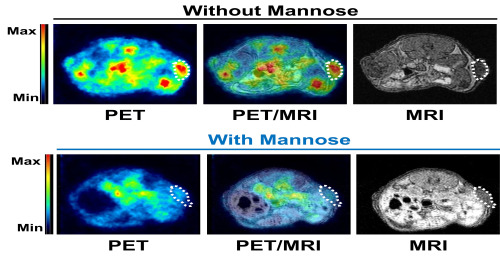 This lab study is a step towards understanding how mannose could be used to help treat cancer. The results of the study, which was funded by Cancer Research UK and Worldwide Cancer Research, are published in Nature, on Wednesday 21st November. Tumours use more glucose than normal, healthy tissues. However, it is very hard to control the amount of glucose in your body through diet alone. In this study, the researchers found that mannose can interfere with glucose to reduce how much sugar cancer cells can use*. The researchers first examined how mice with pancreatic, lung or skin cancer responded when mannose was added to their drinking water and given as an oral treatment. They found that adding the supplement significantly slowed the growth of tumours and did not cause any obvious side effects. To test how mannose could also affect cancer treatment, mice were treated with cisplatin and doxorubicin - two of the most widely used chemotherapy drugs. They found that mannose enhanced the effects of chemotherapy, slowing tumour growth, reducing the size of tumours and even increasing the lifespan of some mice. Several other cancer types, including leukaemia, osteosarcoma, ovarian and bowel cancer, were also investigated. Researchers grew cancer cells in the lab and then treated them with mannose to see whether their growth was affected. Some cells responded well to the treatment, while others did not. It was also found that the presence of an enzyme** that breaks down mannose in cells was a good indicator of how effective treatment was. Mannose is sometimes used for short periods to treat urinary tract infections, but its long-term effects have not been investigated. It’s important that more research is conducted before mannose can be used in cancer patients.